What a full week we have had. Despite having the week off of school, we have been in constant motion. I am once again reminded that we can easily fill our lives with busyness and must be deliberate to schedule and then protect our quiet time. 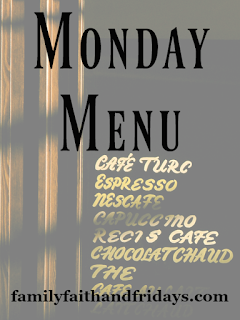 This week's menu is another simple one for you! Remember, I am feeding a real life family with kids, not connoisseurs of fine tastes! I want to spend less time in the kitchen and more time with them, especially seeing how fleeting our time together is. They grow up fast, my friends! Tuesday- Off to eat with friends, you are on your own! Yes, that is 6 full meals and one quick lunch with ONE turkey! That is about $1.66 per meal! FOR MEAT!! The holidays are a perfect time to stock your freezer when turkeys and chickens are rock bottom prices to save your budget the rest of the year! With a little prep and planning, you can have meat ready and waiting to pop in a meal. Win win! Melt 3 TBSP butter and add celery, onion and sage- saute 3-4 minutes. Stir in flour and cook for 2 minutes, stirring. Add stock, stirring to combine and bring to a boil. Stir in rice and season with salt and pepper, bring to boil and simmer for 30 minutes. Meanwhile, saute sliced mushrooms in 1 TBSP of butter. Add turkey, cream, milk, and mushrooms to soup, simmering for about 10 minutes or heated through. I would like to say that worry is not a part of our lives her at Family, Faith and Fridays, but that would not be true. For years I teased my friends, "Why should I stop worrying? It's what I do best!" I have since corrected my ways- mostly! I also have a daughter that was a worrier for years but after a few years of Biblical counseling classes she fixed her thinking and is free of that burden. Now I have a 10 year old that is a worrier. I am not sure if it is an adoption thing or just a personality thing, but none the less, we see it more often than I like. Things like change, new situations, and sometimes even for seemingly no reason at all, he can make himself sick with worry if we do not watch him closely and intervene. It is something we are monitoring, trying to teach him coping skills and right thinking. All that to say, when I recently saw a friend talking about the book When Worry Take Hold, I was intrigued. Anything we can use to help our kiddo is great and the fact that it is a book is a bonus! When Worry Takes Hold, written by Liz Haske, is a 30 page hardback back illustrated by InSong Nam. (You can also get it in paperback, but you know by now I am a sucker for a hardback book!) The book is about a little girl named Maya that one day allows worry to enter her life. With each new day and each new situation, her worry grows larger until she feels consumed by it. Luckily for her, a teacher taught her a coping mechanism called calm breathing, to help her find her courage. -One of the things that I love about this book is that it addresses that Maya made the choice to replace worry with courage by way of calm breathing. It wasn't that she never worried again, but that she greeted it and then moved on. Then she realized that she didn't meet each new thing with "what if", but instead replaced it with right thinking. "I know you will get us there safely." -The second thing I love about this book are the illustrations of worry. It is like a whispy thought cloud seen over Maya's head at the beginning of the book. You will also notice that the pages in the beginning are darker and more subdued. As she finds her courage, the worry becomes smaller and lighter and then not visible at all in the pictures, which in turn have also become lighter and brighter. The mood of the book changes as the mood of Maya and her family changes as well. -The other thing that struck me was the reaction of the parents on the book. "Her parents' smiles faded as they began worrying about her Worry." This was a great conversation starter in our home about how our worry and fear can affect others as well. I think it is also a good reminder to a child that they are not alone in their worry, and that the key is how we then handle it. -And another one- the reminder that worry doesn't ever go completely away and that sometimes it is there to keep us safe, but that ..."courage was just a deep breath away." I cannot think of many people who do not need to hear that at least several times in their lives. -Finally, at the end of the book is a great how-to page on how to find your courage like Maya that explains in simple terms how to take a calming breath. We practiced together after reading the book and now I simply remind Colby about it when he is beginning to walk the worry line. Are our fears and worries gone? No, of course not. But I can tell you this book has been a God-send! It has remained on my living room table for a week now and been read multiple times a day, together, but mostly alone by my son. I think he has found comfort in the words, acceptance in the fact that he is not alone, and courage through the simple breathing technique. Empowering kids to work through their feelings is a must, and I think Liz has done a beautiful job in doing so. Welcome to a holiday week! Thanksgiving is upon us and we are taking the week off of school to relax and reboot our family. Sometimes parents and kids all need a break. We will be minus Riley this year again, but she is joyfully flying to her grandparents' house this week to also enjoy some down time. We are looking forward to having her home in December, right before her birthday! She will be 20, oh my! That is a separate post altogether! So on to our menu for the week- notice there will be turkey! Gobble gobble. You will see its reappearance in a few meals next week as well, since I buy large and freeze in handy 2 cup portions to use for other meals. Saves time and money! Monday- Orange honey Glazed chicken (yes, I know this was from last week, but we ended up going out and it never got cooked so I am trying again this week. If you are looking for something different, pop some chicken breasts in the crock pot and add your favorite sauce. Serve over rice! and of course, pies! Can't forget the pies! It is simple but we love it! Family time needs to be more about the family and less about the food! Do what your family loves and don't worry about the rest. So funny story- I LOVE mashed potatoes. Like REALLY love them. As in often ate them for a meal in college. Just them. (hey, it's what poor starving college students do, right? Except I was never starving!) Anyway, I always loved to use Thanksgiving as an excuse to make them in large amounts. One year we needed to make for a crowd so my mom and I made them quite ahead of time and set them aside. By the time we got around to serving them, they had turned into a bowl of starchy mess. Absolutely horrible, though it did provide a good laugh later. Since that time, because sometimes we feed larger crowds and I prefer to be in the kitchen before people come, not while they are with us, I started making the mashed potato casserole, recipe below. I make it (or two or three) the day before and pop it in the oven an hour before we eat. Saves time, and is just as yummy! I pray your family has a beautiful Thanksgiving! I am grateful for many things, including YOU! This can be made a day ahead and refrigerated until ready to cook. You may need to add 15 minutes of baking time. It's that time of year again! The holidays are drawing near and the excitement is growing. 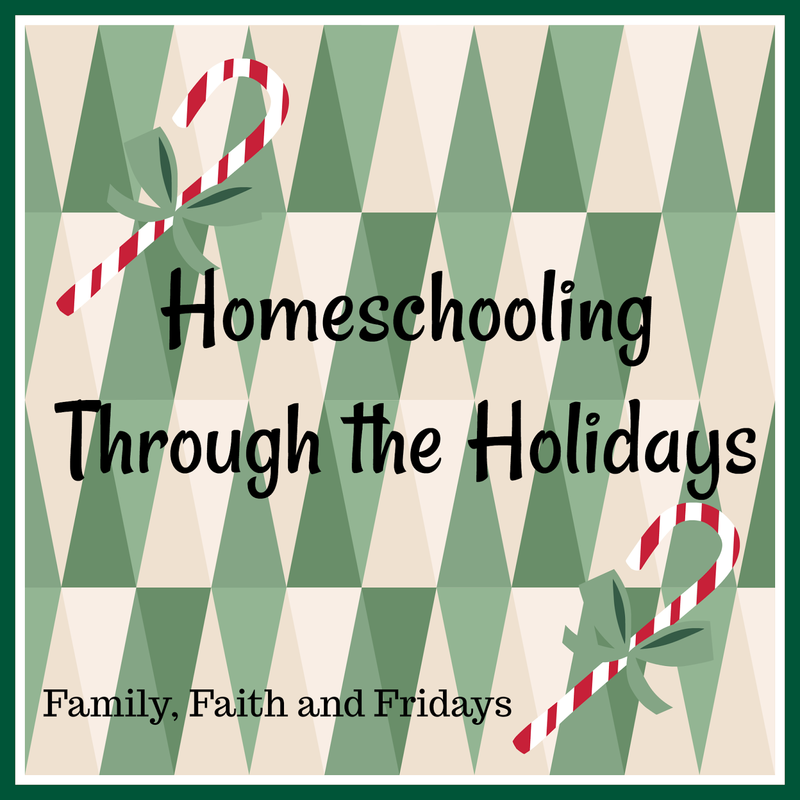 When you homeschool, that often means distracted kiddos and derailed lesson plans. Let's face it, there is something about cold temps, warm fires, snow, and all things Christmas that can just pull at our attention. Not to mention decorations to put up and big feasts to plan, right? So how does one manage to actually get school done in these crazy, but exciting times? Here are a few ideas for you! Unit Studies! I admit these are not my forte, but the few times we have tried them I have not been disappointed. 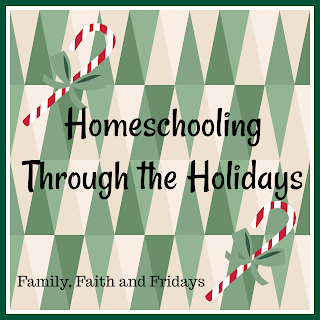 There are so many out there, especially over the holidays, that make learning fun while concentrating on seasonal subjects. Use what you have! Want to do math? Count candy canes. Need to get that art project in? Make Christmas cards for your friends! How about History? Study Saint Nicolas or the very first Christmas! Reading? That's an easy one! Grab a seasonal book and snuggle in for reading time. Make learning fun! When kids are distracted, learning gets a bit more challenging. During these busy times it often helps to add a little something different to your schedule. Put their spelling words into a word search or simply change locations of your "school room" for a few days. Shaking things up can often keep kids more motivated. Cooking Day- Save an afternoon or two and let your kids spend some time baking with you. Measuring flour can surely count as math and following a recipe can be included in our home ec. lesson plans. Jammies Day- We all know that the "homeschoolers do school in their jammies all day" concept is a myth for most of us. But why not interrupt your regularly scheduled day to put on your jammies, grab a cup of hot chocolate and a plate of cookies and school by the fire? Or at least on the couch! Your kids will love it and you might even decide jammies for school are not such a bad idea after all. Embrace the Crazy!- Take some time off of school and just enjoy the season with your kids. Watch Christmas movies together, string popcorn, and sing songs. School will always get done, but the season is short and your time with your kids is even shorter. What Are We Doing with the Turkey? Every year at Thanksgiving I buy a BIG turkey! A big one. Regardless of how many we are feeding. Some years our house has been full and other times it is just a quiet celebration with our family. But regardless of the numbers, I still get a BIG turkey! Because I love using the left overs for other meals. Actually, sometimes those meals are better than the actual Thanksgiving Day meal, in my opinion! 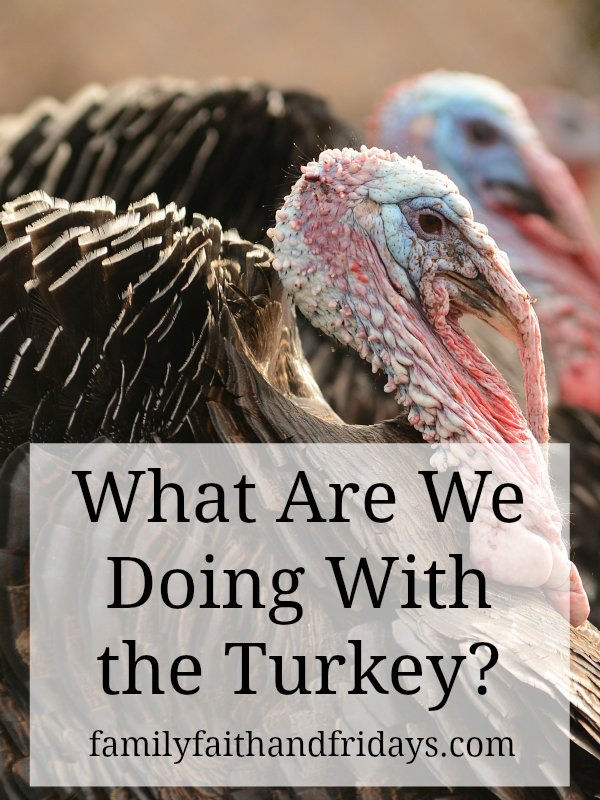 So what do we make with all that turkey? Meal 1- Sliced turkey leftovers. You need to have the Thanksgiving meal at least twice, right?! Meal 3- Turkey Rice Soup (you knew there was a soup coming, right?) We found a great recipe for this soup in a little soup cookbook on the book clearance aisle years ago and it is still a favorite. Meal 4- Turkey Enchiladas This is a good one to freeze for later! Meal 5- Turkey Divan An old standby, but good way to get broccoli into your kids! So yes, be looking for these meals on the menu plan after Thanksgiving, and don't worry, I do not have them all in a row! Usually the Saturday after Thanksgiving I take all the meat off the bone and freeze it in 2 cup portions for easy grab and go use in recipes later! I would challenge you to see how many meals you can get out of one turkey- you might be pleasantly surprised! What do YOU do with leftover turkey? It's Monday AGAIN! Why does it always seem to come out of the blue? This weekend has been busy and I feel like a need a rest from my weekend! Like that will happen, right? So here ya go, friends! Enjoy! Thursday- Out to eat with out of town friends! So let me tell you about the soup! When we lived in North Dakota one of my dearest friends and I got the idea to have "Fun Fridays" together. I have shared this before. Each Friday one of us would make muffins for both families for breakfast and one would make soup for lunch for both families. We had soup together after we did school with the kids. Then the following week we would swap who made what. It was about a year of blessings and beautiful memories and still brings a smile to my face whenever I think about it. There is just something about soup that warms your soul. Maybe it was just that it was shared with beloved friends. Anyway, we tried a lot of soups that year, this just being one that the kids liked best so we kept it in our rotation. Simple and yet yummy! Stir in V8 juice, soup mix, seasoning pack, and veggies. Bring to a boil, reduce heat and simmer 6 minutes. Return to boil, stir in noodles and cook for 3 minutes. Welcome friends! 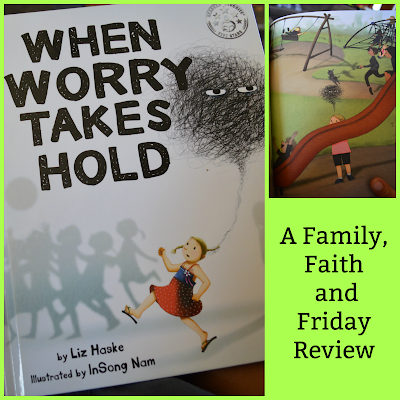 As you may have noticed by now, Family, Faith and Fridays is a conglomerate of subjects- from homeschooling, to reviews, to modesty, meal plans and raising kids, to random thoughts from my head. Some call it a Lifestyle Blog. Some just call it craziness and are along for the ride. Either way, I am glad you are here and I appreciate that you stick with us. Gotta be honest here for a minute. When I began blogging several years ago I wrote every Monday, Wednesday and Friday. Every. Single. One. I must have had a lot to say I guess. Then as my kids got older, I found myself with less spare time to write and with less to write as life, well, things that just were not public knowledge to protect the privacy of growing and maturing young adults. But, quite frankly, it put me into a panic when I skipped a day because I was afraid I would lose my readership. And maybe I did some days. My intention was never to make money off this blog (I do not) or be a power blogger (I am not). My intentions were to share my heart, help homeschooling mommas like me, and occasionally inspire or relate to some of you. When you are the writer behind a blog it is hard to measure those things. Is success a number? Is it how many people viewed your blog in any given day or how many followers you have or even how many people leave comments? The jury is still out on that! Recently, I have contemplated shutting this blog down for various reasons. Then I put up a post like Refined, and I stop in my tracks. There are people out there still reading this blog. And they are people just like me that need a little encouragement and need to know they are not alone. Know how I know that? For every comment you see on my posts on our FB page, I received twice that many in my personal email or messages. People who reach out with a simple thanks or personal story and remind me that we all need cheerleaders in our lives. So for now, I am sticking around! After all, I have some cheering to do! One of the things I am quickly seeing as my children grow up and head to college, is that there is no lack for things they could do or be when they "grow up". Unfortunately, I am also seeing that sometimes our knowledge of those actual things is what is really lacking. In a determination to level the playing field a bit, I have begun to try to help expose my almost 16 year old to as many different things that I can via school courses. My recent endeavor lined up easily in the form of a review from Innovators Tribe and their Thinking Like an Architect program. Not only did I know my son would be semi interested in the program, I figured I might also get him to make a house plan for me in the process. A win win situation, don't you think? Since we received a two year subscription good for the whole family, we have plenty of time to work through the program and go back and review when we need to. Thinking Like an Architect is a self paced, online course taught by Mr. Wayne Kroeplin. Recommended for grades 6-12th, each online lesson is fairly short and therefore easy to watch. Mr. K, as he refers to himself to the students, walks you through numerous slides, most often with him in the side bar actually talking to you. At the end of most lessons there is a project of some sort to help solidify the lesson being taught, including things like researching types of architecture and making a power point presentation with the information gather, to of course, creating blue prints of a house. Luckily for you, when you register for the class Thinking Like an Architect you will also be given access to the 3D software program to help you with that process. Lesson 1- What is Architecture? Lesson 4- What's an Architect? Once a lesson is completed it will show a green check mark next to it for easy reference. Customer Support- Let me just tell you Wayne is a gem! I had a snafu with receiving the architect software, my issue, not theirs, and Wayne patiently worked with me until I got it and was able to download it. A company that responds right away and in a polite fashion wins me over every time. Fun without being silly- In the world that we live in today, we often seem to want to hold kids' attention by silly entertainment. I love that though this program does have fun and is light hearted, talking directly to the student, it is not dumbed down. Included software- What a bonus! The program just wouldn't be the same without the chance to try your new skills in a real life program. WE haven't gotten quite that far yet, but we can't wait to try. Video links- I love that when additional things were explained or shown, like "how well do you have to draw to be an architect", direct links were included for the student to access. It makes it easier as well as safer use of the internet to have those links. Because each course requires at least 30 hours of work total, you can use it to fulfill a 1/4 credit hour on your child's transcript. If you use the projects for each lesson as a jumping point, I have no doubt you could expand those hours and create a semester credit. We will! Extra Activities- Well, these I loved more than Salem, of course. I especially loved that a few required a power point presentation, a media tool that Salem has not used before. While that took a bit more time to learn, it was a skill worth learning! Also included is unit journal to print off that has a few questions to answer for each lesson. If your student is doing this program entirely on their own this a quick and easy way to make sure they are getting the basic ideas down. What Salem had to say- "Despite my initial reservations, I am really enjoying this program so far. I like that it is more detailed than just 'what is an architect' and that it teaches you how to design a building." Do we like Thinking Like an Architect? Yes, we do! And would highly recommend it to you and your 6th-12th graders! It is a fun way to learn about a new career possibility and stretch your designing creativity. Can't wait to show you my dream house some day! 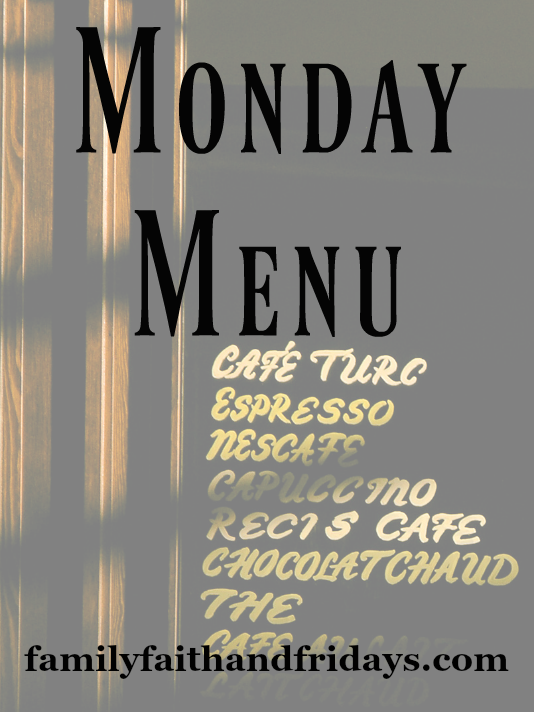 Welcome back to another Monday Menu! We are glad you are here. Remember, this is what my family is actually eating for the week and are planned with kids in mind. Simplicity is the key, you will not find many fancy things here. For years I tried to keep up with the Joneses and then I realized there was no reason to try to impress anyone, especially my own family, with dinner. It is more about sustenance and family time, and less about fancy ingredients and meals no one likes. Let's talk savings for a minutes before I give you a recipe from last week's meal plan. You may notice that often we plan chicken meals twice a week. (I know, this week is three) The reason for this is simple. I buy a large package of chicken from the commissary (you can find them at Sam's Club as well) and then immediately bring it home and slice each breast in half and then freeze those in portions that fit our family. One, it saves money and two, it gives you a more reasonable sized chicken breast that is also faster and easier to cook. So in theory, each large pack of chicken I buy feeds us for four meals. I also found THE deal of the year recently when I bought an entire 10 pound bag of diced ham for $10. (Notice the scalloped ham and potatoes and the framers casserole in the menu!) I freeze the ham in two cup servings and then use in simple casseroles, for breakfast meals, and even in fried rice! It will last us for a long time and saves a HUGE amount of money as well! Be on the lookout for your local sales and stock up on meat when you see it at good prices. Then plan your menu around what you have in the freezer. Make sure you freeze things in family-sized portions to make it easier to pull out and use. You will also notice that we have started doing soups or sandwiches for most Sundays. Easy for me who needs a break, and cost effective because let's face it, most soups are pretty inexpensive to make. It's a win win, especially in the fall and winter seasons. Ok, so there are my helpful hints for the week. You are welcome! ;) And here is your recipe for the week- better get out there soon before it is too cold to grill out! Combine ketchup, honey, Worcestershire sauce, and salt and pepper. Put chicken on skewers and cook on grill 6-8 minutes, basting with sauce. I do not want too much time in this month to go by before I mention thankfulness. It is after all, the month to spotlight that theme, right? While I fully believe that we should teach our children (and ourselves) the many lessons of thankfulness, I must admit that it often gets buried beneath the piles of schoolwork and laundry if I am not careful. 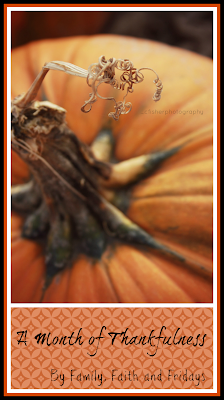 Therefore- I am thankful for a month to highlight THANKFULNESS! Here's how we are doing it! Thankful mirror!- Each day we will decide as a family one thing we are thankful for, write it on a construction paper leaf and post it on our big mirror in our living room for all to see. Yes, you can make a tree or put them on your door or what ever location you choose, just make sure you put it where all can see! Read scripture!- Do you know how many scriptures there are that talk of thankfulness? What a great theme to use as memories verses for the month of November! Here are just a few, but there are so many more you can find! Study the first Thanksgiving!- Whether you read a book, google the info, or use a specific unit study, November is a great time to read about the very first Thanksgiving and remember how thankful we should be to the brave souls of the past who came to this country and paved a way for us! Write notes of thanks!- Let's face it, snail mail and beautiful letter writing is almost a thing of old. Sad, but true. This month we are writing a note of thanks to someone in our lives each week to thank them for who they are. What about you? What are some ways you are showing Thankfulness this month? I am a sucker for a man in uniform. After all, I have been married to one for 25 years. Some send their husbands off with a kiss to an office. I send mine away with a kiss and a prayer, often to secret locations around the world. And while none of us are promised tomorrow, it seems the life of the military are even a bit more precarious and uncertain. Just ask the many spouses and families of wounded or killed service men and women. The numbers are staggering. Those number make a book like Is Your Dad a Pirate? even more precious and needed in today's world! Is Your Dad a Pirate?, written by Tara McClary Reeves, is a 32 page hard back book that explores how one family handles the curiosity of strangers when the man of the house returns home from battle wounded. Taken from the life experience of Tara when her father was wounded as a Marine Corp Lieutenant, this book will touch you and open your eyes to the life of the military family. You will also probably need to grad a tissue, just be forewarned. Told from a young child's perspective, one can feel the pride she feels for her father, as well as the fear she felt when he went away to fight. It talks of prayers and feelings of excitement of a future reunion. It also talks of the fear and anguish of a phone call telling of an injury. But Is Your Dad a Pirate tells mostly of the courage of a family. Of the response to the question- "How did you lose your eye and arm?" And the mom's answer- "He gave them in service to our country." Don't you love it?! A sweet and simple answer to an honest question from a child. No ugliness, no embarrassment, no judgment. But a lesson to both the child of the man injured and to the child who asked the question. Later when the question was asked again, it was the dad's own child who answered, and you will love her answer even more! I am honored to have this beautifully illustrated book on my bookshelf. It reminds us of the heroes who fight for our freedom every day and of the families that support them daily. It is a reminder to us all that the freedom we enjoy often comes with a price. Oh that we would continue to teach our children and our children's children about that price and the special people behind it! I have an extra copy of Is Your Dad a Pirate to bless one of my readers with! Just leave me a comment here on the blog and a random winner will be chosen next Friday!